IMPROVED VERSION:slimmer profile, reduced weight, extended clip range, attachable to the headstock when not in use. 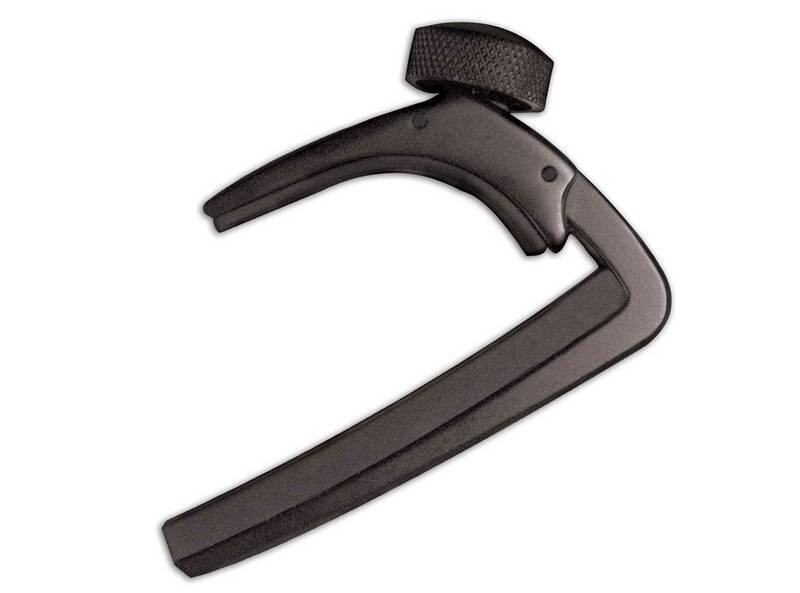 The NS Capo has been re-designed with the slimmer profile of the NS Ukulele, Banjo and Mandolin Capos. The improved design provides a lighter design, but with the familiar features for which the NS Capo is known. In addition, the NS Capo now also has an elongated clip for thinner neck profiles and can thus also be placed practically at the head plate when not in use. TheNS Capo Pro is the product of an ongoing collaboration between famed product designer Ned Steinberger and J. D'Addario & Company. It employs a sleek, ultra-light design for fast and accurate one hand positioning on the guitar's neck. Just turn the smooth, tactile dial to eliminate the string buzzing and enjoy perfect, in-tune performance. Lightweight aluminum adds virtually no weight to the guitar's neck when in use.